Relationships are unavoidable regardless of the connection. There are a ton of ways that people can be connected. Some are connected by marriage and blood. Others are connected by acquaintance. The list goes on and on. One thing for sure, everybody has one. Relationships should be nourished like a delicate flower. 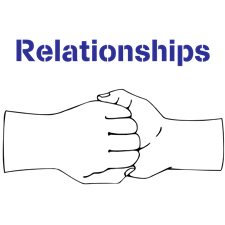 I know we don't go around thinking about growing meaningful relationships with others. I have heard so many people say that they don't need anybody but God. Well, the fact of the matter is, you need people even if you have God. God uses people to bless others. I say all of this to say that you never know when you are speaking to someone that may help you later. It has happened to me on countless occasions. You just never know. Always follow the rule of thumb - be kind to others at all times. You know the saying, if you don't have anything nice to say then don't say anything at all. If you opt to say nothing, then smile and nod. That will suffice. Visit Every Good and Perfect Gift Shop for Unique Gift Ideas .